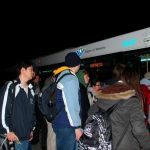 In 2009, Regional Council did not support a recommended budget issue to address overcrowding, so Grand River Transit transferred 4000 annual service hours to its heaviest used routes from its lighter-used ones — yet overcrowding remains a serious problem. Regional Council is again being presented with a budget issue to address ongoing overcrowding, with a request for a meagre 2900 additional service hours in 2010. When a bus leaves a would-be rider behind, that helps turn that rider off transit as a viable means of transportation. 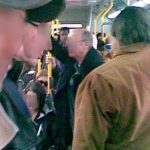 At a time when Waterloo Region is actively attempting to promote transit services and increase ridership this is not acceptable. 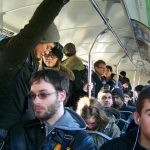 By hindering the perception of transit, persistent overcrowding also has the potential to decrease support for transit funding, thereby exacerbating the problem. Particularly during a time of recession, it is critical that transit is available to those who need it. And considering the longer term, investment in transit is more cost-effective than is the road expansion that insufficient transit spurs. Hard economic times are an opportunity for the encouraged growth of transit, and there is a cost to failing to take advantage of that opportunity. Hopefully Council realizes this and approves the recommended budget issue. This November, we asked people to send in photos for the Sardine Challenge, and we’d like to thank all who participated. 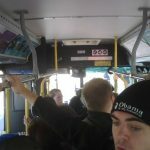 The below photos should help illustrate the situation on a number of Grand River Transit’s routes. Investigation by the Tri-Cities Transport Action Group (TriTAG) reveals that the planned 2010 budget for the Region of Waterloo is heavily skewed towards road expansion and makes minimal investments in transit, cycling, and pedestrian infrastructure. At last night’s Regional budget committee public input meeting, TriTAG spoke in support of more funding for transit, pedestrian, and cycling infrastructure. The 2010 Regional transportation budget includes $71 million set aside for growth-related road expansion, but only $2.1 million for improved sidewalks and bike lanes. The entirety of the Federal Gas Tax Fund, intended to be used for environmentally sustainable municipal infrastructure projects, will be spent on roads. If even half of the Federal Gas Tax Fund were diverted from road spending, the budget for sidewalks and bike lanes could be increased threefold. TriTAG also advocated for transit funding to alleviate the overcrowding crisis on many routes. The full text of TriTAG’s speech is included below. 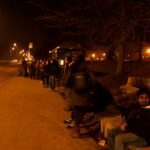 With the arrival of colder weather, GRT is seeing a huge spike in ridership and some customers are being left behind as they are passed by full-to-capacity buses. However, without more money from Regional Council now, GRT can’t hire more drivers to put buses on the road or mechanics to keep them there. Write your Regional Councillor and ask for them to provide an emergency increase to the transit budget. The current state of underfunding is not good for the growth of public transit — one morning left out in the cold may well drive those new-to-transit right back to their private vehicles. According to a report by the Real Estate Investment Group, Waterloo Region is the best place in Ontario to invest in real estate. In an interview with CBC News, Don Campbell, head of the Real Estate Investment Group, cited the region’s Light Rail rapid transit plan as one of the reasons to invest in the area. The report credits Light Rail as a method to significantly improve property values, even when established before higher-density development begins.